The forth post in a series of 8 in my hands-on tech training will be about Azure Virtual Machines. VMs is probably one of the most documented and blogged about resources in Azure, so it’s a pretty vanilla subject. 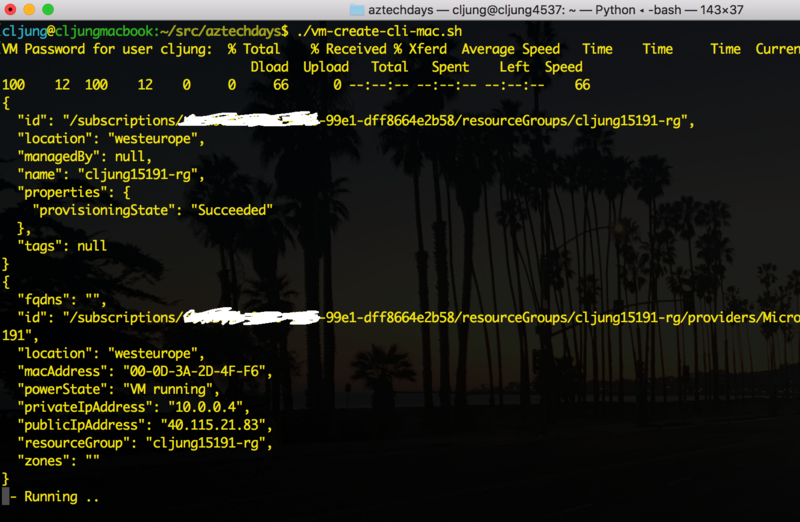 I’ll try to highlight the differences between how Powershell and the CLI helps you provisioning a VM. The VM we will create will be a Ubuntu VM that we will use as our dev/build VM in episode 5 on Containers and Azure Kubernetes Services. In the old Classic days of Azure, a VM was created with lots of defaults surrounding it, like a virtual network being just there for your machine, a NIC auto-provisioned for you (how did you get a 2nd one?). With the move to the ARM model (Azure Resource Manager), creating a VM became the art of provisioning everything yourself, much like assembling your new furniture you bought from IKEA. and if we are talking about a cluster of machines we can add even more things like Load Balancer, Availability Sets, etc etc. CLI takes the approach of doing as much as it can for you so you don’t need to specify all things it can figure out for itself. The code below is pretty short compared to what we will see in Powershell later. The az vm create does alot of things, like creating the Storage Account, the NIC, the VNet and the Public ip address. It even creates the Network Security Group and opens port 22 for us since it sees that we are creating a Linux VM. What remains for us is to open the additional ports we want. az group create --location westeurope --name "$rgname"
az vm create --resource-group "$rgname" --name "$vmname" --image "UbuntuLTS"
--storage-account "$(echo $vmname)stg" --storage-sku "Standard_LRS"
az network nsg rule create --resource-group "$rgname" --nsg-name "$nsgname"
--priority 110 --source-address-prefix "$_PIP" --source-port-range "*"
--priority 120 --source-address-prefix "$_PIP" --source-port-range "*"
az vm extension set --resource-group "$rgname" --vm-name "$vmname" --name "customScript"
The Powershell version of provisioning a VM has the option of filling in all the default for you, but the problem is that it assumes too much in our case. For instance, the default is a Windows Server 2016 and we want a Ubuntu Linux OS. In order to get what we want we need to do this piece by piece. 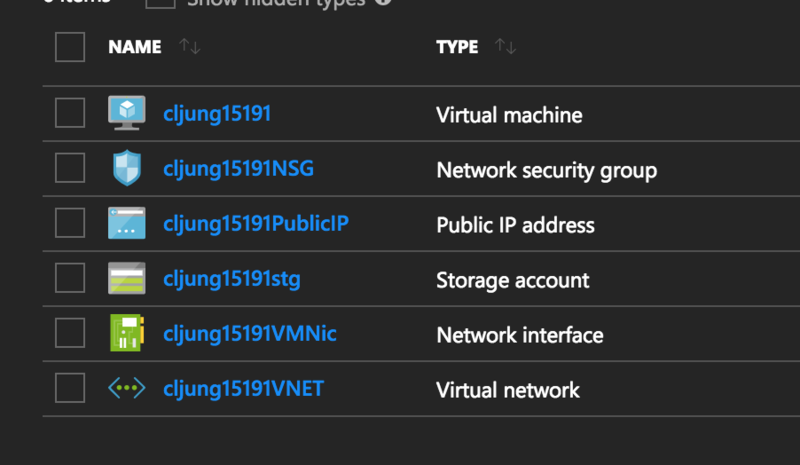 New-AzureRmResourceGroup -Name "$rgname" -Location "$location"
$StorageAccount = New-AzureRMStorageAccount -Location "$location" -ResourceGroupName "$rgname"
$container = New-AzureStorageContainer -Name "vhds" -Permission "Blob"
$subnetConfig = New-AzureRmVirtualNetworkSubnetConfig -Name "mySubnet"
$vnet = New-AzureRmVirtualNetwork -ResourceGroupName "$rgname" -Location "$location"
$pip = New-AzureRmPublicIpAddress -ResourceGroupName "$rgname" -Location "$location"
$nsg = New-AzureRmNetworkSecurityGroup -ResourceGroupName "$rgname" -Location "$location"
$nic = New-AzureRmNetworkInterface -Name "$nicname" -ResourceGroupName "$rgname"
Set-AzureRmVMSourceImage -PublisherName "Canonical" -Offer "UbuntuServer" -Skus "16.04-LTS"
We start with creating the Storage Account, then the VNet and the Public ip address, since they are all independent of the rest. Then we create the NSGs, allowing port 22, 80 and 8080 before we create the NIC, since we attach the NSG to the NIC. The New-AzureRmVmConfig part is where we all all details about the VM, and finally we invoke New-AzureRmVm to do the heavy lifting of provisioning. Running the bash script ubuntu-install-devtools.sh is done the same way, ie using the VM extension. Set-AzureRmVMExtension -ResourceGroupName $rgname -VMName $vmname -Name "CustomScriptforLInux"
and produces these resources in Azure. As you can see, the CLI gives resources their names by appending “VMNic” to the VM name when creating the NIC, etc. It does a decent job, but if you don’t like these names, you have to provision the resources piece by piece in CLI just like you do in Powershell. You trade some flexibility here. The bash script ubuntu-install-devtools.sh is executed during the creation of the VM by the agent present on the VM (called waagent). All OS images that are provided in the Azure Marketplace have this agent preinstalled. It is the agent that helps you in cases you need to reset the password, so don’t uninstall it unless you have very special needs. The reason for installing all this is that it is all components we need for the Containers/Kubernetes exercise. Theoretically, you could install it on your own laptop, but I find it easier to have a small lab VM that I can play with when trying out new things. The script also creates a secondary script file, named download-azure-container-script.sh, that you are going to use in the next Container. It will be located in your home directory. This post illustrates the steps needed to provision a VM in Azure and running an installation command at creation time. It is in no way unique but rather from a scripting beginners perspective. It will create a VM that can be used for building a Container Application running on Azure Kubernetes Services.